Blue with two orange markings on the pronotum (hard shell between wings and head). Native to the Caribbean but widely introduced for biological control. Apparently imported to Florida from Mexico in the 1950s. Not much on this one. They feed on scale insects. I'll definitely keep looking. Thalassa montezumae is the one on the top. Aren't they pretty? Info and photos from Bugguide. Copyright infringement not intended. I'm glad I was able to help you put a name to your mystery bug. I myself hope to see one someday. Really amazing ladybug! Never observed this species in our area so far. Hopefully you'll get lucky soon. Love ladybugs. Thanks for this post. 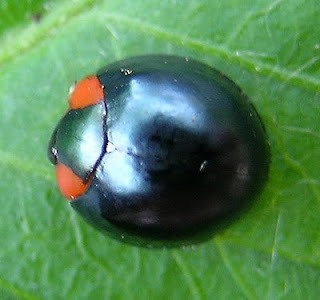 I live in Hawaii, and when I was growing up we had the tiny tiny red-and-black ladybugs, but now I only see these blue/black ones. In fact, we went camping this past weekend, and they were all nestled in the loose parts of the tree bark. It looked like someone had jammed dozens of pushpins into the tree. I wasn't sure if they were actually ladybugs. They bite/pinch. @Anonymous1 You're very welcome! Must've been a sight to see. =) Glad to be able to help. @Anonymous2 They bite? I've never heard of such a thing on my research. I have to look into this further. 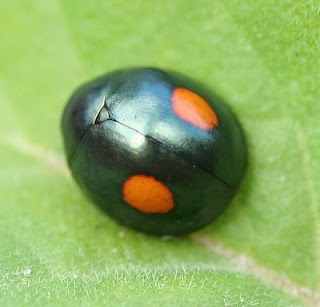 Harmonia axyridis can give you a little nip once in a blue moon but I've never heard of blue lady bugs doing so. I wish you guys wouldn't go by "Anonymous" because I can't properly thank you. Found one of these in a park in southwest Florida, Estero to be exact. Got a photo but not sure how to post on here. I just found one. It was one the back of my neck and i swatted it, sorry. I had to look it up since i had never seen one before in my life 50+. Not 100% positive on the id but thought i'd leave a comment. Im near toronto ontario. I noticed the original post was 2009. The comment i made above about the sighting is for 2017!